To make sure your financial resources are used most effectively, it’s important to eliminate unnecessary business costs wherever possible. Wasteful and unnecessary expenses are not only bad business practice – they may deprive your business of money when you need it most. As well as tackling direct costs, you also need to consider old-fashioned methods or outdated equipment that wastes time – as this also wastes money indirectly due to inefficiency. 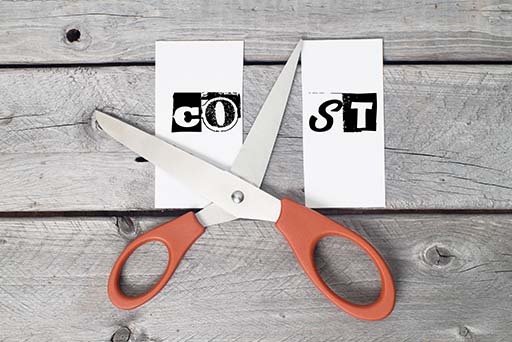 Here are 8 ways to cut back on unnecessary costs through smarter business practices. While you can’t expect one employee to do the work of two, you’ll get better value by hiring well-rounded individuals with different skills and areas of knowledge. Rather than relying on a large number of employees who can only perform specific tasks, hire individuals who can think out of the box and are good at problem-solving. An employee who can offer creative new solutions to a perennial business problem will pay for themselves many times over. Businesses that struggle to recruit and retain the best employees waste a lot of money seeking replacements and re-training them. Motivated and well-rewarded workers are happier, more productive and stay longer in their jobs. While financial incentives are important, recognising good work performance, team-building and creating a healthy and positive work environment can make a big difference too – and costs a lot less! More employees today are seeking a better work-life balance through flexible working hours, job-sharing or working from home. As long as employees are still able to perform their jobs satisfactorily, giving them more flexibility will improve morale, minimise work-related illness and stress, and encourage individuals to stay in their jobs. With more employees job-sharing or working remotely, you can also reduce overheads by removing unnecessary desks and furniture or even moving to a smaller office with lower rental costs. Many businesses overlook one of the easiest ways to make savings – ask for a discount. If you’re looking to develop a long-term relationship with your vendors or suppliers, negotiate a discount for your future loyalty. Most businesses factor in an anticipated discount request when they give their initial asking price so if you don’t negotiate, they’ll be making extra money at your expense. On the other hand, if you haven’t raised your own prices for a while with a loyal client or customer, don’t be afraid to ask for more. You should never sell your own services too cheaply simply to hold onto a customer. If your drab office is draining energy and sapping morale, you’re wasting money by not getting the best performance out of your employees. A splash of paint to brighten the mood, a few office plants to improve air quality, increasing the amount of natural light by opening windows and blinds – techniques such as these cost little but can boost productivity significantly by improving employee health and wellbeing. It may seem counter-intuitive to save money by paying others to do your work for you. However, time is money so it’s inefficient to spend a long time re-designing your website, marketing your business or even doing your accounts and taxes if you can hire someone to do the job far quicker – and with much better results! Depending on your type of business, you may also want to outsource your reception services, customer enquiries and other departments. Using a professional contact centre or other outsourcing service can increase your business performance and boost profits. Unnecessary meetings or redundant emails and calls are a serious drain on business productivity. To reduce time-wasting, always consider the best form of communication for each circumstance. Sometimes you’ll need to have a face-to-face meeting to achieve the best result but, at other times, an email will probably do just as well. If a group meeting is required, invite only those individuals whose input is necessary – the others could probably be doing more important work than simply attending. You can also use web-based tools and applications to hold virtual meetings, cutting down on time and travel costs. Invest in new hardware and software to streamline processes and increase productivity. Using web-based applications to handle your day-to-day business tasks – such as finances, customer services invoicing, HR and payroll – will improve delivery speed and performance. Another way to streamline work and improve performance is to provide employees with mobile devices such as smartphones and tablets for work purposes. Synchronising workflow using mobile technology allows employees to work on the move and remain up to date with the latest business developments. By eliminating unnecessary costs and making the most of available tools to improve performance, you’ll have more money to reinvest in your core business activities. Start by drawing up a list of practices that cost your business more than they need to – then come up with ways to make them more efficient. You’ll be surprised by how many business costs you can reduce without reducing performance! If your business is struggling financially, we can talk to you about your best options. Call us or email us using the details below, or fill out the online enquiry form. Alternitvely visit our advice for businesses page for more information, and take a look at our blog, 4 things that will help you if you have a struggling business. Next Is your restaurant having cashflow problems?